Update: It's been almost a year, exactly, since I published this post. And the For Science Crew has been playing together for over a year. So I figured it was about time to take a new look at Khet's playlist and revise it. I play Khet-sa-mun, an exotic aasimar paladin from a fabled land across the sea, who has a secret, troubling mission and a healthy amount of caution around arcane magic. I can't even adequately say how much I love this game and this group. We have amazing chemistry in-character and out-of-character and our heroes are already developing all sorts of hilarious quirks and relationships. 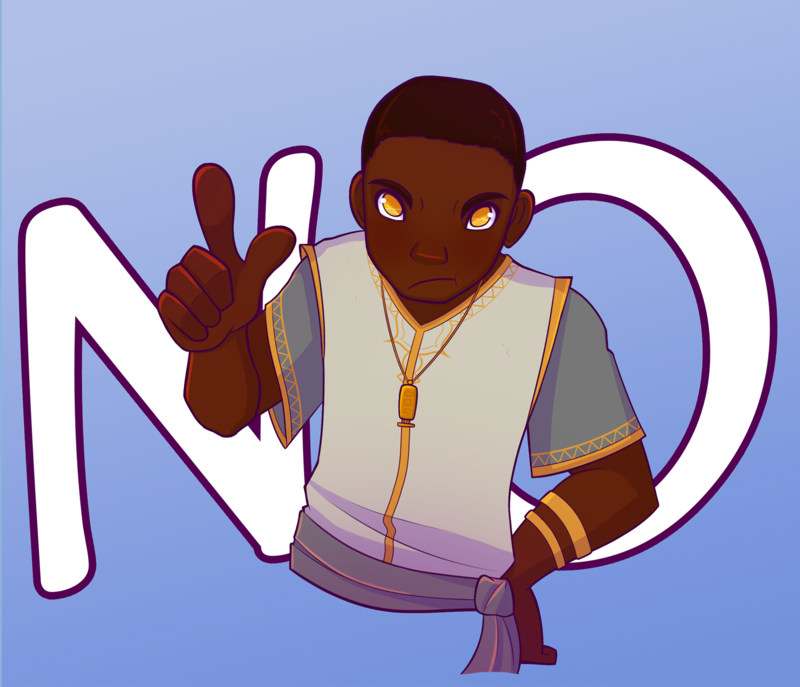 For example, Khet's deep concern around arcane magic and magical items means he often finds himself saying "No!" to the poorly considered experiments crafted up by his companions, which earned our group the name the For Science Crew! In keeping with my tradition of making Spotify playlists inspired by my D&D characters, I put one together for Khet. The playlist is just below and beneath that is a bit of explanation of why the songs relate to my angelic mother hen of a paladin. Khet was born an aasimar, bearing a tiny fragment of the divine light of his sun god, Ahmat. This song makes me think of a young Khet and the darkness and trials that the seers sensed he would face, but also of the potential for him to be a light in that darkness. This is a purely instrumental piece, but as a scourge aasimar, Khet's divine light surges in his soul, sometimes to dangerous levels. He has always had to balance this power with its inherent danger. On the outside, Khet often seems reserved, quiet, mysterious. But that's only barely hiding a heart full of deep passions, convictions, and turmoil. As these emotions grow stronger, so too does the radiant fire within him. When Khet begins to lose control over that radiant fire in his heart, one of the very first signs is his eyes begin to glow with wispy, smoky light. It's often a good time to put some space between you and him. For much of his life, Khet has been guided by visions from gods or from monsters. They try to shape him and use him for their own ends and fuel the darkest parts of his nature. It isn't until he breaks free of the influence of unrealized futures that he can finally live his own life. Khet's life is a constant struggle for control, of his own destiny and of the power that burns within him. To lose the former means losing his way. To lose the latter makes him a danger to those around him. Before Khet can feel at peace with his own path in life, he is going to have to face Eshrael, his angelic guide, one of the beings who has used prophecy and visions to influence Khet's journey. At first, his companions did not know Khet was an aasimar, but now they know that they travel with two celestial beings: Khet and Aegis, an angel whose soul was bound into an automaton body. The chorus of this song is Khet finally realizing what he wants to do, what he needs to do, as opposed to what he's been told to do all his life. That's the point where Khet's story really starts to turn around and when he begins to become his own hero. Following the storyline of this playlist, this song represents Khet's determination against the darkness. It will not win. No matter how many times it knocks him down, he will rise back up. As will his companions. Khet is very far from home, across the sea and trapped on an extradimensional island. But someday he will find his way home, figuratively or literally. And until then, he will not give up. Sometimes, the sun that Khet looks to for guidance seems so far away. Whether it's on the timeless island of Fianna or deep in the Shadowfell, Khet must always keep his eyes towards the sun to follow the path he believes is right. I chose to end with this song partially because I liked the contrast between the tiny light that the playlist begins with and the sun that it ends with. But Khet follows the beliefs of a sun god and bears a piece of that sun god in him, a small sun that empowers him. And as the song says, he will always follow all the way to the sun.